My thirteenth ground of 2018 was on Saturday 28th April at the Recreation Ground in Sheerwater, Surrey. 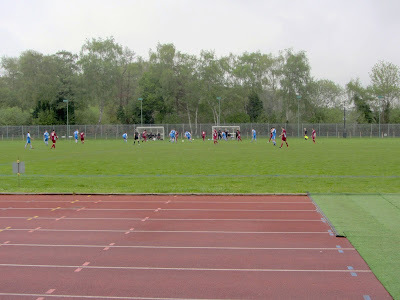 The match was Sheerwater vs. Kensington Borough in the Combined Counties League Division One. The Recreation Ground is located in the north of the village with two full-size pitches, one inside the ground itself and one directly to the west. The ground has housing to the north and south and a school to the east. 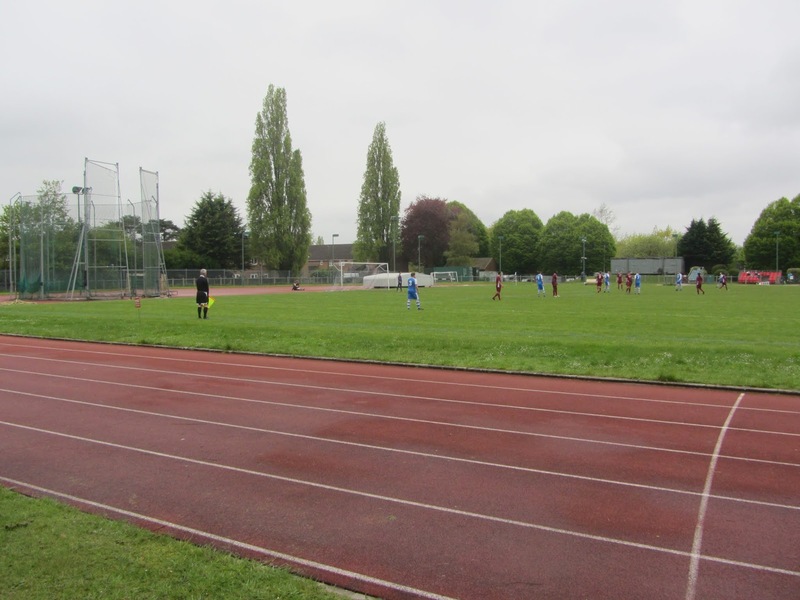 The club played at the site from their formation in 1958 up until May 2018 when they vacated the site to make way for a widescale regeneration of the area which will see the demolition of the current Recreation Ground. The club will enter a groundshare arrangement at nearby Woking FC for the 2018/19 season. The west side of the venue had a series of seating areas. The main one of this was a covered stand which straddled the half-way line - this had 67 seats spread across three rows. Behind this on a lower level was a club building which housed a small clubhouse as well as the dressing rooms. To the south of this stand was an uncovered all-seater stand with 65 seats across seven rows. Adjacent to this stand was an odd metal structure with 11 seats spread across six rows with two seats per row up to the final row with one seat. This area was earmarked for officials. To the north of the main stand was uncovered standing on a strip of concrete which ran until the end of the pitch with a grass bank behind. 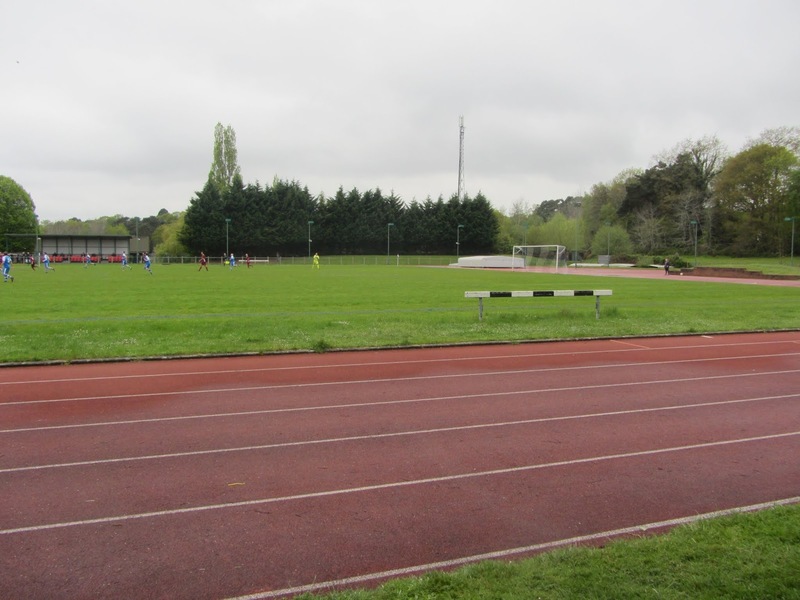 With this site being an athletics stadium there was a six-lane running track encircling the pitch giving it an oval shape. The northern end had an uncovered grass bank with a footpath of concrete stones curving round for the whole side before petering out as it transitioned into the eastern side of the ground. The eastern side was uncovered grass with no hard standing area. The two structures on this side were the dugouts either side of the half-way line. There was a hammer/shotput cage in the south-east corner with the rest of the southern end a flat grass section with the curve resulting in it becoming fairly narrow at its middle point due to the adjacent houses. With Sheerwater riding high in the league and aiming for promotion they were keen to get three points on the board to aid them to the Premier Division. They almost took the lead in the 3rd minute when Alex Headland took a shot on the left which was spilled into the path of Shane Rideout who took too long to compose himself and saw his shot blocked. In the 9th minute a Sheerwater header at the back post was tipped onto the bar and from the next corner a scramble on the line saw the hosts appeal for a goal which was not given. With all this pressure it was no surprise when Sheerwater did get in front after a quarter of an hour. The home side had had a lot of play down the left and once again left-back Alex Headland was unleashed and this time he no made no mistake shooting low across goal into the bottom corner. The home side went 2-0 up in the 19th minute as Shane Rideout received the ball 12 yards out and coolly slotted low past the diving keeper. The next goal came in the 25th minute and was a spectacular one with Andrew Rothwell's half-volley from 25 yards flying into the top corner. Sheerwater went 4-0 up in the 28th minute when a pass deflected off a defender back to Alex Headland who had plenty of space to knock low into the net from 12 yards out. Sheerwater had the ball in the net for a fifth time before the half-hour mark but this time Shane Rideout was denied by an offside flag. After a dismal opening to the game Kensington finally managed to get out of their own half and the run-up until half-time saw them give a much more competitive account of themselves as they created a few opportunities. They continued this better spell into the second half and got a goal back in the 53rd minute when a through ball to one of their strikers was slid under the advancing keeper. Sheerwater didn't take kindly to a potential comeback and a half-volley from Chris Machay five minutes later was only a crossbar away from restoring the four-goal lead. In the 66th minute Machay was able to grab his goal though as he was played in on goal, and though he was taken wide by the keeper he was able to get past the a covering defender and shoot at goal with a defender running back only able to help it across the line. Kensington were not happy with this goal as they claimed they had paused for a substitution to take place. Their gesticulations delayed the restart slightly and they were clearly still thinking about it as Sheerwater grabbed their sixth of the day straight from the kick-off when Shane Rideout having plenty of time to slot past the goalie with the away defence missing in action. In the 78th minute the hosts scored an extremely simple goal as goal kick was punted up field, headed on to Robbie Wilson who poked past the advancing goalie from the edge of the box. Three minutes later the score went to 8-1 as Michael Leech headed in a corner. In injury time Chris Machay did get the ball in the net as well but it was ruled out for offside. 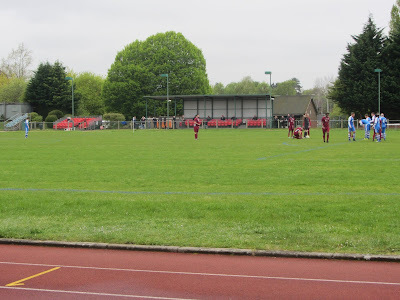 Apart from the middle half-hour of the game Sheerwater completely demolished their opponents and even without the two offside goals the number of chances they enjoyed could easily have seen them into double figures against a Kensington side which were wide open at the back.